When Canon announced its first full-frame mirrorless camera in the EOS R, there was a lot of excitement. But just making one camera was a bit of a head-scratcher when everyone else was releasing two at a time. Nikon released two versions of its mirrorless platform in the Z6 and Z7, and so did Panasonic with the Lumix S1 and S1R. 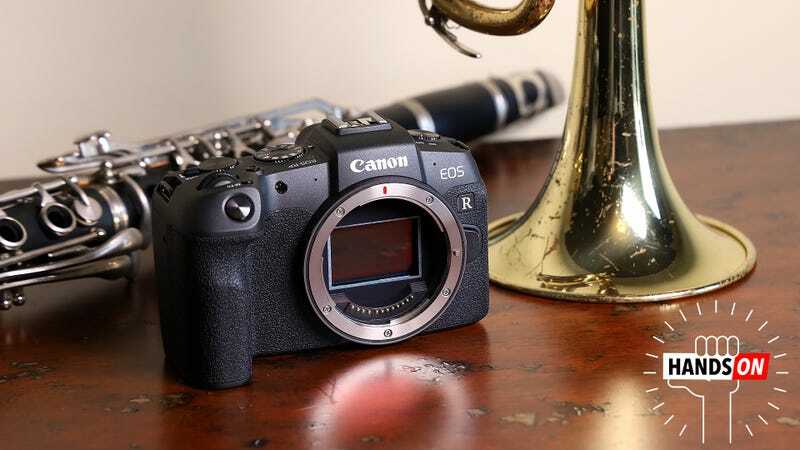 On top of that, the EOS R doesn’t quite have the specs, resolution, or video chops to really satisfy pros, while its $2,300 (body only) price tag makes it a tough sell to newbs or amateurs looking to upgrade. But with the introduction of the new 26.2-MP EOS RP, Canon’s full-frame mirrorless master plan is starting to make a lot of sense. Not only does the EOS RP offer one of the most compact bodies you can get from a full-frame camera (it’s actually smaller and lighter than a Rebel T7i), but starting at $1,300 (body only), it’s easily the best deal in the category too. The only full-frame mirrorless cameras that even come close in price are the original Sony A7 from 2013 at $800, and the slightly more recent A7II from 2014 at $1,000. What you get in return though is a shockingly good value that delivers what feels like 90 percent of the EOS R’s capabilities for $1,000 less. In fact, at 1.07 pounds (with a SD card and battery) and measuring 5.22 x 3.35 x 2.76 inches, the EOS RP is even smaller than a Sony A7III, and thanks to its more profound grip, it’s much more comfortable to hold. One drawback to the RP’s compact design though is that people with larger hands may find their pinky finger dangling off the bottom of the camera, though that is easily addressed with an $80 grip extension. My bigger complaints with the RP is that like the R, there are a couple things that don’t seem fully optimized. One example is the dial on left side reserved entirely for turning the camera on and off. It seems like it could be better served pulling double duty as a shooting speed selector or ISO dial, two functions that otherwise need at least a couple taps in various menus to adjust. I also wish that by default, the EOS RP’s D-pad was set to control the camera’s focus point selector. That means out of the box, you’re forced to rely on the RP’s 3-inch touchscreen until you feel like spending a bunch of time sifting through dense lists of settings to enable something that should be turned on by default. However, when you actually start snapping pictures, almost all of these little annoyances quickly fade away. The combination of a compact body mated to a big full-frame sensor results in an affordable camera that exceeds expectations. In low-light, shots at ISO 6,400 only showed minimal noise, while shots in bright light looked sharp and colorful across the board. When compared side-by-side with a $3,400 Nikon Z7, the EOS RP showed a bit a blurriness towards the edge of the frame and slightly less dynamic range. Yet it’s hard to be too upset considering there’s a $2,000 price gap between the two cameras. Unfortunately, like the EOS R, the EOS RP doesn’t offer in-body stabilization as you would get on Nikon’s Z camera or a Sony A7III. But here’s the thing. On a $2,300 camera, that’s a big sticking point. On a $1,300 camera, suddenly that omission is way less offensive. And in a way, that really sums the EOS RP as a whole. At just $1,300, the EOS RP brings the best things about the full-frame mirrorless camera, like superb image quality, compact dimensions, and nifty autofocus features, down to a price that new and amateur photographers can actually afford. And with Canon also announcing six news RF lens designed to work with its full-frame mirrorless cameras due out before the end of 2019, the currently limited selection of native lenses won’t be an issue for too much longer. And even though I only had one day to mess around with the EOS RP, it already feels like one of the best examples of why we should care about the new breed of big sensor mirrorless cams. The Canon EOS RP will be available starting in March for $1,300 (body only) along with a free lens adapter (for non-RF Canon glass) and extended grip, or as part of a kit with an EF 24-105mm kit for $1,700, or an RF 24-105mm lens (which is the same kit lens you get on the EOS R) for $2,200. Previous articleWhat’s Going on With This YouTube Chuck E. Cheese Conspiracy Theory?